WHERE ARE YOU FROM AND WHY DID YOU DECIDE TO MOVE HERE? Toronto, Canada is where I was born and raised, the baseball diamond and golf course is where I spent most of my days. What brought me to this picturesque island was merely a change of scenery with a short-term forecast, coming up on 3 wonderful years later. With having West-Indian roots, father is from Grenada, the tropical sunshine and Caribbean lifestyle run in the veins. What initially started as a hobby developed into a career that I’m extremely fortunate for. With an education and past work experience in Finance & Business, I always felt that something was missing. After taking photos with my iPhone I realized that I loved capturing more than an image. Within every frame there is a story to be told. It was amazing to me that every photo I took on my phone was sending a message. Fast forward a few months and leaving my financial profession, I decided to approach wedding photography, because what stronger message is there than love? I have been so fortunate to travel and do what I love and have come to make lasting friendships with the couples I meet. ADVICE FOR PEOPLE LOOKING TO VISIT CAYMAN? Seven Mile Beach is a must see attraction, with miles of white sandy beaches and blue, clean waters. Unless you are staying on the beach, beach access can be hard due to lack of parking, however parking is available at public, governors, cemetery, and west bay beaches. People drive on the left and is not that hard; just follow the cars. There are lots of roundabouts; you have to yield to cars on the right and once inside you have the right of way. Because the country is a religious nation, Sundays are taken very seriously. Every business except gas stations, resorts, some restaurants are closed all day Sunday. Bars stop serving alcohol by 12:00am Sunday. The island is a conservative place in which that beach attire is inappropriate outside the beaches, even though it is a casual place. Cover your attire when leaving. With growing development on the island, traffic can be quite bad to and from Georgetown during rush hours when cruise ship traffic is at its peak so try and avoid if possible. With so many great restaurants on the island, its difficult to narrow down to one favourite. Hence why Grand Cayman is known as the Culinary Capital of the Caribbean. A few locations are: Vivo, Anchor & Den, Bread & Chocolate. Vivo, Tukka, Coccoloba, Andiamo, Czech Inn, Chicken Chicken. WHERE'S GOOD TO GO FOR DINNER? Luca, Casa 43, Aqua, Papagallo. YOU CAPTURE PEOPLE'S MOST ROMANTIC & SPECIAL MOMENTS, WHERE'S THE MOST ROMANTIC PLACE ON ISLAND IN YOUR OPINION? Romantic locations vary based on the individuals and their personalities. A stunning and calming sunset view along Seven Mile Beach never disappoints. Also just taking a drive with no destination in mind to witness all the beautiful that the island has to offer .. stargazing on the east / north side, where there is very little light pollution is probably my place to be. WHAT'S YOUR ADVICE FOR PEOPLE GETTING MARRIED IN CAYMAN? Be aware of all the marriage requirements in terms of all the right documentation that is required. Dress accordingly to the weather and style of the wedding. The Cayman dress code is typically smart Casual unless formal is indicated. Plan accordingly regarding buying the wedding necessities. The island has a vast array of shops for gifts and favours, but nowhere near the same variety you’ll find in the US and Europe. I’d recommend getting off the beaten path and explore .. botanical gardens, mastic trail and then experiencing Stingray City via a jet ski tour. Being on the water, zipping across the crystal clear waters is an exhilaration that’s difficult to match. ANY EXCITING TRAVEL PLANS WITH YOUR CAMERA? I’m quite fortunate to be in a position to travel the world with my camera and capture destination weddings, elopements and general travel imagery. Some of the upcoming locations for 2019 are: Moab-Utah, Germany, Ireland, Turkey, Ukraine, North Carolina, Toronto, Nova Scotia. Born and raised in the heart of Toronto, I took a chance on the island to avoid winter in 2015. WHAT ADVICE WOULD YOU GIVE TO SOMEONE LOOKING TO VISIT CAYMAN? Instagram is a great tool to do some research of the island's offerings, from local food tours to scuba diving - it helps to see photo and video content to plan your dream vacation. Although it is technically “Brunch” - the Marriott is my favourite spot for breakfast on a Sunday. They have the cutest mason jars filled with the most delicious breakfast bites. The vibe is awesome and the mimosas are not to be missed! Lunch is easy, South West Collective has a gorgeous air-conditioned view of George Town and they even have a fully stocked bar, which you wouldn't expect from their super delicious (yet health-conscious) menu. The food is carefully curated to look as good as it tastes and their staff are the most friendly! There are so many incredible restaurants here in Cayman you can’t go wrong but I always enjoy Edoardo’s! On a Friday night you can finish up and cross over into Barolo where the party is just getting started on their patio. It’s always a see and be seen hotspot and a good time! They have one of my favourite wines there, Tamber Bey Deux Cheveaux Chardonnay from Napa Valley. Must see attraction is a famous 7 mile sunset! The best spot to see this from is ON the water. The guys @cobaltcustomcharters cruise over to east end but can also charter along the beautiful 7 mile with pickups nearly anywhere along the famous strip of beach. The Performance Lab is the spot. From Boxing to HIIT class and high quality personal training with the best on island, these guys know how to transform a body and lifestyle and make working out fun. My favourite class is their Friday Happy Half Hour with DJ and glow in the dark strobe lighting, a must try! YOU ALWAYS LOOK SO FLAWLESS, WHAT ARE THE BEST SPA TREATMENTS ON ISLAND? No.11 Spa has saved my life here in Cayman. The sun and salt are incredible during a beach day but long-term my skin needs extra TLC. Nurse Kelly at No.11 specializes in incredible treatments that have rid me of any blemishes and left my skin glowing. Highly recommend. WHAT'S THE BEST PLACE TO SPEND A WEEKEND IN CAYMAN? I recently enjoyed a Staycation at The Ritz. The outstanding service and quality of every aspect of that property is astounding. The service as a whole, the food and the cocktails are all top notch. WHAT SHOULD BE ON OUR CAYMAN BUCKET LIST? Rum Point On a Sunday! I’ve never seen anything like it. If you’ve got a group of friends - Cayman Private Charters has the most gorgeous 60 foot Sea Ray with a hidden jetski on board. If I told you this, they wouldn’t be hidden anymore! What I can tell you is PRIME FOOD TOURS is your guide to the best local hidden gems on island! BEST PLACE FOR A SUNDOWNER? This one is tough - can I give my top 3? Calicos, Palms and Rackhams. Not in any particular order. I am originally from Milan, Italy. But for the past ten years I’ve been living in few different countries like Jamaica, Australia and Thailand. I moved here for the pristine water of Cayman… a paradise for an underwater photographer like me. WHAT GOT YOU INTO PHOTOGRAPHY? ADVICE FOR PEOPLE LOOKING TO VISIT CAYMAN? Coming from Italy, I grow up surrounded by amazing art and artists, there you get inspired from everything that is around you and from all the art exhibits we have. I think a big impact on me was made from the book “The Decisive Moment” by Cartier-Bresson, it opened my eyes on photography and on the way I look at the world. I always had the need to create and to express myself, before was with painting but when I started traveling around I discovered that photography was the perfect fit for me. A good thing about Cayman is that its a small country, really easy to get around or to fly to the sister islands from Grand Cayman. It’s also a safe island, perfect for “Solo Travelers” or for a “Girl Only” vacation type. My favorite beach is Spotts Beach, it never feel’s busy and snorkeling is phenomenal … perfect spot for swimming with the green sea turtles. 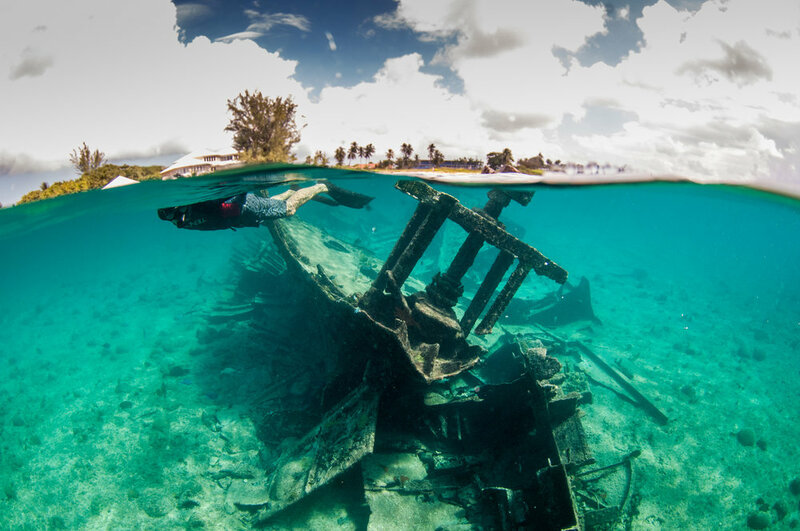 My hidden spot is underwater, I love the Gamma Wreck on the south part of Seven Mile Beach. Really shallow wreck, perfect for underwater photography or for a fun afternoon of snorkeling. WHAT'S THE BEST LOCAL HANGOUT? I really like to hang out at Macabuca on the North West point of the island, it’s a fantastic cozy oceanfront tiki bar with amazing food and drinks. FAVOURITE SUNSET SPOT? I love watching the sunset on Seven Mile beach near Boggy Sand road, it’s really quite never crowded and picture perfect. 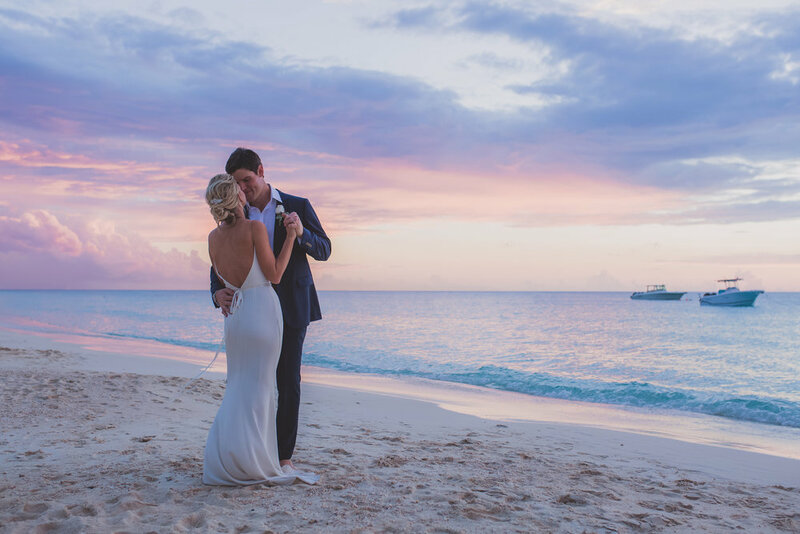 YOU SHOOT A LOT OF WEDDINGS, WHAT'S YOUR ADVICE FOR PEOPLE GETTING MARRIED IN CAYMAN? Cayman is perfect for destination weddings for the easy flights we have from the USA daily. Plus you can’t beat the turquoise water and white sand of the world famous Seven Mile Beach for a dream wedding setting. 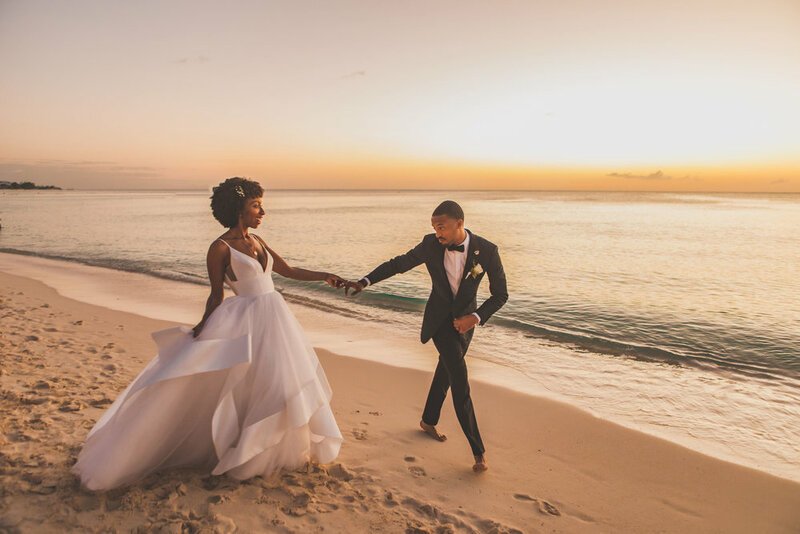 Just be prepared for the hot weather when you pick up your wedding attire, especially for the groom, standing on the beach with a full suit can get hard. WHAT MAKES CAYMAN SO UNIQUE? I fell in love with Cayman for the underwater world, with the 100+ feet of visibility underwater and this is one of the reasons Cayman is one of the best diving destinations in the world. A must is taking a boat tour out to Stingray City sandbar, where you can interact with the southern stingray. A really amazing experience. WHAT'S NEW WITH YOU, ANY EXCITING TRAVEL PLANS WITH YOUR CAMERA? I just spent the past 11 months traveling in North America in a Van, from the Florida Key all the way to Arctic Ocean in Canada to Alaska and back to Florida touching all the 50 states… it was a journey of 36 thousand miles and thousands of photographs! Next, before settling down in Cayman again, I am planning a European road trip with another Van. It seems like at the moment I can’t stop seeking beauty all around the world but Cayman has a special place in my heart. I was born in Cayman. My Mother is from Jamaica and my Dad is from Cayman. Started DJing professionally in 1998. I Moved to Miami in 2001 but came back in 2012. My name is Peter John Balls “PJ”, but know also as Ballsy in general or the fishing community. I was born in Grand Cayman, and spent the better part of life in Cayman besides some school in Canada. My parents migrated here from Jamaica in 1973. My Father was a Barclays Offshore manager who moved & lived throughout the Caribbean and then eventually made Cayman his home. Happy go lucky island girl slowly seeing the rest of the world. Favorite things are fresh coconut water and exploring with my camera. I was born in Trinidad to a Caymanian father and Trinidadian mother. We moved to Cayman Brac when I was around 5. My parents then came to Grand Cayman to find work and I stayed in the Brac with my grandparents. Eventually my sisters and I moved over to Grand Cayman to join my parents when they settled into jobs and a house. We lived on Shedden Road in an old style Cayman home which is now the site of the building Anderson’s Square. And that’s pretty much where we grew up until my parents bought a “modern” house on Walkers Rd. Well, I was born in Cayman to a Caymanian mother, Carlene, and a British father, Alistair or 'Alex' as he was fondly known. I consider myself to be pretty lucky having grown up with a large, close-knit family and an idyllic childhood, living at Silver Sands condos and roaming Seven Mile Beach at every waking moment. I was a real beach baby! At seventeen I headed off to boarding school in Canada where I attended Trinity College School (which my husband says reminds him of Hogwarts) and then on to Western University in Ontario to pursue a Bachelor’s Degree with a major in Psychology. Upon returning to Cayman I threw myself into beach volleyball and then Miss Cayman Islands. And what amazing adventures those were! Hello! I’m Jade Webster and I am extremely lucky to call the Cayman Islands home! Born in the '90’s to a Scottish mum and a Caymanian dad. My younger sister and I didn’t particularly grow up in a district, as we seemed to move quite a bit. Growing up in the Cayman Islands was and still is pretty amazing! HI ALYSSA, WHY DON’T YOU TELL US ABOUT YOURSELF? I’m Alyssa Gilbert. I’m 19, from West Bay and was raised as an only child with a half-sister. My family works in legal, government, and IT related fields. My hobbies include shopping, going to the beach, filming videos, reading, and my new favourite: going to afternoon tea. WE LOVE TEA! SO WHAT DO YOU DO NOW? SO WHERE ARE YOUR TOP 3 PLACES TO GO SHOPPING FOR THE BEST FASHION? My favorite places to shop in cayman are NKY in Camana Bay, Funky Monkey at Governors Square, and Kirk Freeport for my accessories. WHAT DO YOU LOVE MOST ABOUT CAYMAN? My favourite thing about Cayman is by far the beach. It’s the only place that I feel at peace and could stay there for hours on end. Not to mention it’s the only place I can get my color back after living in London for a while! WORST THING ABOUT THE ISLAND? PET PEEVE? My least favorite things about Cayman at the moment are the lack of untouched land, the ridiculous amounts of litter everywhere, and the pesky mosquitoes in the afternoon. CAN YOU NAME 4 OF YOUR FAVOURITE RESTAURANTS FOR US? My four favourite restaurants on island are Ragazzi, Casanova, Papagallos and Copper Falls. I LOVE Italian food, and Copper Falls is on a whole other level of deliciousness! WHAT ABOUT THOSE HIDDEN GEMS? TELL US ABOUT SOME COOL PLACES! Some “hidden gems” that I enjoy going to for some peace and quiet are the side beaches in East End (through a path of trees on the side of the road) and Boggy Sands. For some good eats, I like Di Kit-Chin Jerk Stand and Grape Tree Cafe. FAVOURITE LOCAL DISH AND WHERE CAN YOU FIND IT? My favorite local dish is Cayman Style Beef with rice and beans and you can find it in my grandmother’s kitchen, Island Taste restaurant, and anywhere else that sells local cooked food. WHAT ABOUT A COCKTAIL, WHERE WOULD YOU CHOOSE TO GO FOR SUNSET DRINKS? TELL US ABOUT YOURSELF, BRITTANY! I’m a born and raised Caymanian. My Caymanian roots run deep. My father was born in Jamaica to a Caymanian mother and my mother was born in the US to Caymanian parents. They both moved to Cayman full time in their teens and met while working at Foster’s Food Fair and then got married and had me. WHAT DO YOU DO HERE IN CAYMAN? I’m a film writer & producer. I work in Cayman and the US and I’m currently based in LA. I just wrapped on two feature films in South Florida. In Cayman I produced the Frank E Flower’s short film Tocsin. This short was made with an all Caymanian crew, which was a really exciting and proud moment for me. To have so many talented local individuals working and collaborating on one project was amazing. THAT IS AMAZING! SO WHERE WOULD YOU SEND PEOPLE HERE IF THEY ARE INTERESTED IN THE FILM INDUSTRY? There are so many talented individuals working in the film industry in Cayman. The thing about Cayman is that it’s so small, so everyone knows or knows of everyone. If you’re looking to get involved in the film industry I recommend going to local film screenings, talking with the filmmakers, camera crew and actors (they don’t bite!) I would also recommend the newly found record label GoldFyr, where local Cinematographer Samuel Lancaster is holding film lessons and they also provide film equipment rentals. TOP 3 PLACES FOR BREAKFAST? Anchor & Den Brunch at The Marriott: I am obsessed with this brunch. Their food never disappoints, their atmosphere is so serene and the staff is so lovely. Over The Edge: For me, it is a bit of a haul to get there, but the view and their delicious Ackee & Codfish makes the drive worth it. Kirk’s Supermarket: They have a full spread and it’s so easy to grab and go. Their cornmeal porridge is pretty delicious as well. SO WHAT'S YOUR FAVOURITE PLACE FOR A TRUE CAYMANIAN DISH? There’s a place in Savannah behind the Wendy’s and Rubis called Chill Spot. I love their oxtail and pepper steak. FAVOURITE PLACE TO BE IN CAYMAN AND WHY? I love being at my grandma’s house. It’s right near the airport, so we can hear the planes landing. She has a lot of large mango and breadfruit trees. Just watching the sunset through those trees reminds me of how beautiful life is on this tiny island. WHERE WOULD SEND PEOPLE FOR DIVING? FISHING? SNORKELING? For fishing and a good time out on the water I would send them to Get Bent Charters. For a simple snorkel I would recommend Smith’s Cove on a calm day or anywhere on the waterfront on a day with no cruise ships in. ANY ACTIVITIES PEOPLE SHOULD TRY WHEN THEY'RE HERE? If you’re interested in local culture and history, check out The National Gallery, The Museum, Pedro Castle and The Botanical Gardens. I’m obsessed with the bioluminescence kayaking tour, it’s absolutely stunning to experience. And Brunch, always brunch. 25-year-old squash player, Eilidh Bridgeman gives us the low down on the local hotspots, why she loves breakfast so much and what it’s like living in a bikini ( and looking great in it!) on the beach.